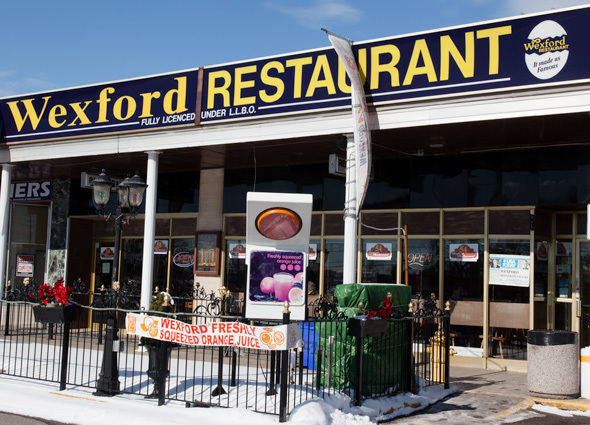 The Wexford Restaurant has been a Scarborough institution for over 50 years. 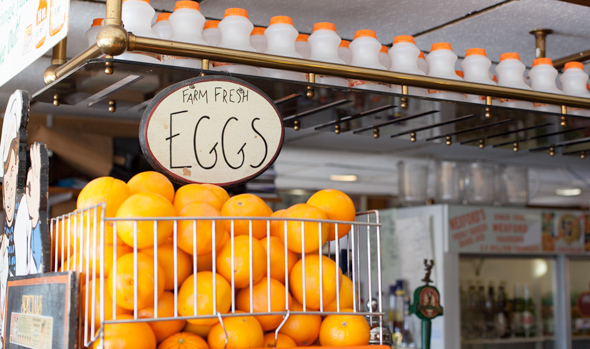 Located near Warden and Lawrence, this family-operated eatery claims to have cracked over 720 million eggs and juiced over 2 billion oranges. And it shows. With an interior that looks like it belongs in a '70s rec room, you can almost smell the smoke stains on the walls. Each menu contains the 'legacy' of the restaurant, the brothers who started it, and a sizeable story boasting their egg purchasing power. But no one comes to the Wexford for any sort of prestige. 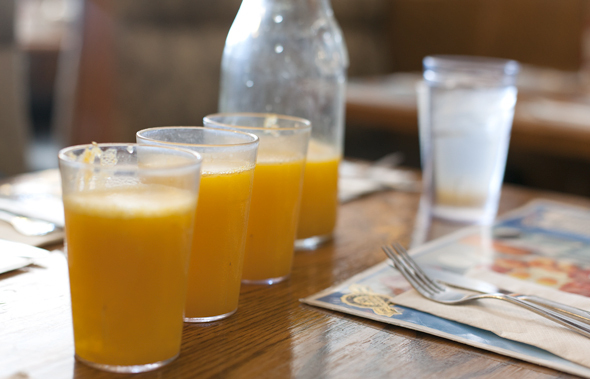 People travel (some in a time machine it appears) from all over to slop up their greasy spoon atmosphere and drink orange juice by the litre ($10.95). While they are open for lunch and dinner, breakfast is the main meal here, offered all day for those who like their eggs for dinner. And if you like beer with your eggs, they are licensed, but don't expect any fancy cocktails or premium lagers. Domestic reigns supreme here, so embrace your surroundings and grab a Canadian. 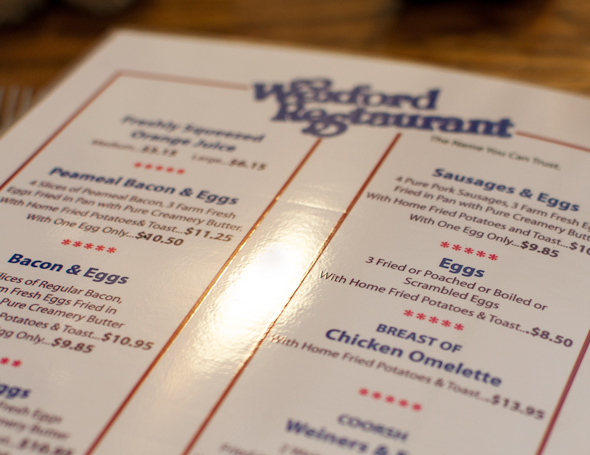 Hot food choices are wide-ranging, and old school throwbacks like baby beef liver or corned beef on rye supplement the dinner menu, but we were sticking to breakfast. 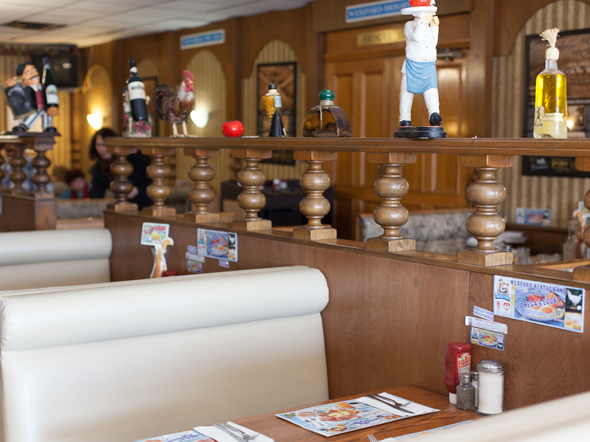 Service is typical diner-style. Most waitresses seem to have worked here all along--they never miss a beat, calling each customer by the obligatory honey/darling moniker, and regulars by their first name--and are swift and sweet in their service. 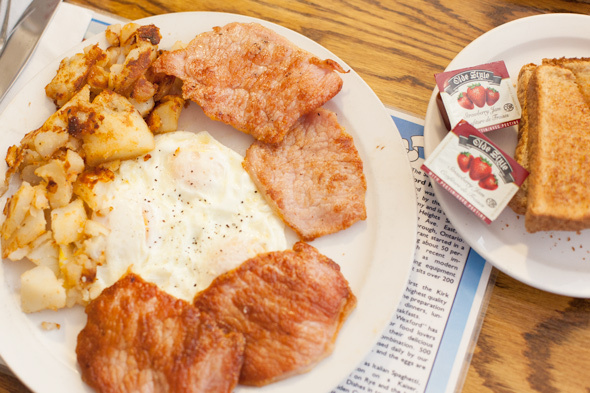 The celebrated 'Our Famous Breakfast' ($13.95) consisting of three eggs, four pieces of peameal bacon, an ample portion of home fries, and two slices of toast was a pretty standard plate with no frills. Or garnish. Or colour. As far as assembling a meal most of us could do blindfolded and without any special ability, it was nevertheless pretty tasty. Eggs were cooked to a proper over-easy, toast had no burnt corners, and the home fries were salty and satisfying, although a little raw in the middle of some of the bigger chunks. Cheese, green bell peppers, onions, and diced ham speckled the Western Omelette ($13.50). Also served with a substantial side of home fries and buttered toast, the omelette was massive, and took up half the plate. While whipping up an omelette isn't rocket science, it was delicious comfort food done well. 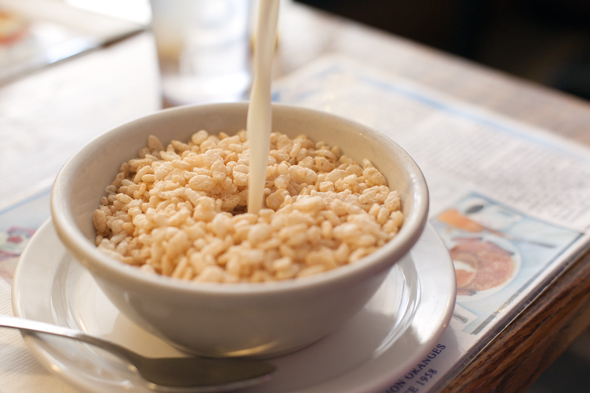 If cereal is more your thing, the Wexford offers Raisin Bran, Corn Flakes, or Rice Krispies at a choke-worthy $5.25. At least it comes with milk in a plastic cup. 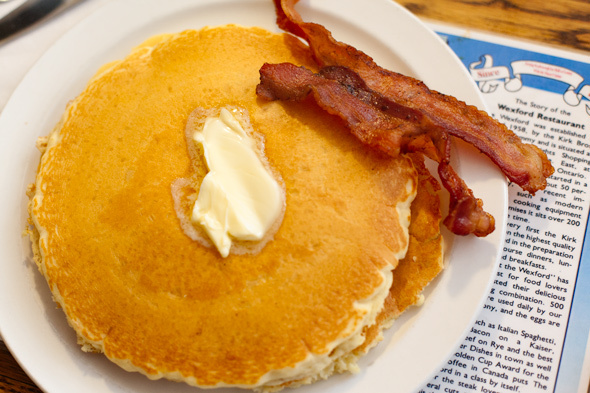 Wheat pancakes ($7.50 off the kids menu) come two to a portion, with a side of bacon rashers. The buttery sweet pancakes were almost comically large, especially since it was supposed to be a child's portion. Fluffy in the outer ridges, but somewhat dense and cakey in the middle, they were not my favourite flapjacks . Saying the prices here are steep is an understatement. I was charged $2.15 for a coffee, which is pricey but not unheard of, until you factor in that there are no free refills. I spent $6.45 total for watery coffee. I'm not sure what's more bitter; the coffee, or the taste in my mouth after getting the bill. Aside from that, if you know what to expect, you can get a decent meal without being gouged. Drink the free water, and share a portion with an extra side. It should be noted the above prices reflect their holiday menu, which inflates the prices by about 15%. According to staff, the owner passes on the increased price of labour on statutory holidays to the customers. Classy! The Wexford Restaurant is not wheelchair accessible.